Upon dying, Al Simmons was offered the opportunity to prolong his…existence and get a chance to see his wife one more time. He accepts the deal which, of course, is not what he anticiapated. Al returns to Earth as a hellspawn (Spawn for short) an officer in Lucifer’s army. His job is to fill the ranks of Hell’s army by dispatching those unsavory souls a tad early. Al has bits and pieces of his memory and spends a lot of time trying to put it all together. He returns to Earth in an alley in the worst part of town and soon finds himself acting as the protector to the homeless that congregate there. Most of those that he is protecting them from are coming for Spawn. Years have past between the time that Al died and when he returned to Earth. His wife has remarried (to his best friend) and now has a child. He longs for his wife and his attachment to her is often used by those around him to manipulate him. I will stop there, as going further could spoil some things for any of you that might buy this. 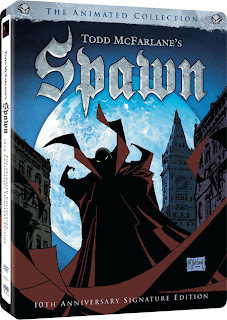 Spawn was ahead of its time, with stylish graphics and decidedly mature storylines. The show aired late night on HBO and won two Emmys. Their utilization of the freedoms that cable offers was well ahead of The Sopranos and those that followed. For extras, we get some commentary tracks by creator Todd McFarlane. Those are entertaining and insightful. Todd talks about the evolution of the character and how Spawn came to be. Certainly worth watching….listening to. Among the featurettes is an interview of McFarlane. It is an interesting piece because he talks about the field of darker comics that Spawn was a part of. Unfortunately, he avoids discussing any of the clashes he has had, in his career, with others within the industry. Unfortunate but certainly understandable. I saw the first handful of episodes when they aired. Having watched the entire series, I can’t imagine why this did not become “must see TV” for me. The art is stylish and the stories dark and thrilling. The dark nature of it will appeal to many that enjoy Noir, but I can also think this is a must have for those that enjoy the darker fantasy fiction that has become popular. I am beyond happy to see you posting!